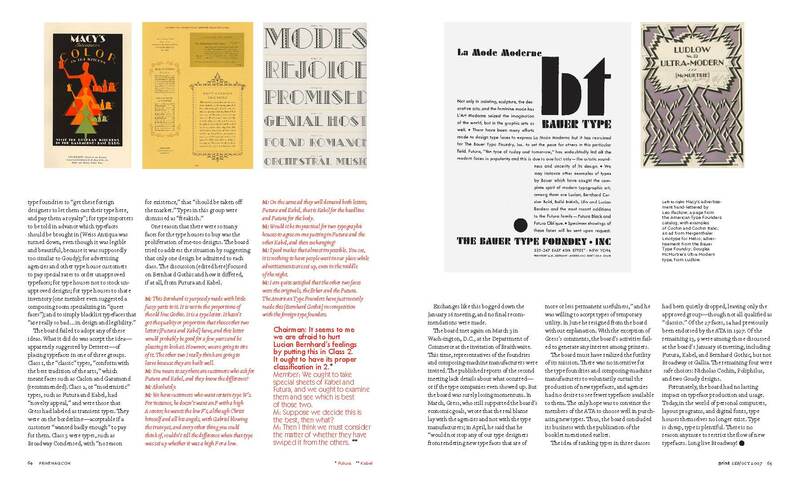 In 2007 I wrote an article for Print magazine (LXI:V) titled “Stop Making Type” about an organization called the National Board on Printing Type Faces and its doomed attempt in 1929/1930 to limit the number of new typefaces being produced. Since the article is not available on Imprint I am posting my original text and some images from the issue here. I am doing it because I have come across some additional material about the organization at the Newberry Library in Chicago and the Rare Book and Manuscript Library at Columbia University which I will discuss in another post. National Board on Printing Type Faces: Its Organization and Work, a slim booklet of 16 pages published by the American Typographers Association sometime in late 1930 or early 1931, concludes with a list of recommended typefaces. It was the culmination of a curious and quixotic year-long attempt by typographers and type houses to control or, at the least, heavily influence both the production of new typefaces in the United States and the importation of European ones. The story ofﬁcially begins on September 17, 1929 when the American Typographers Association (ATA), at its annual convention, passed a resolution to create a Board “to pass judgment on all new type faces offered from either domestic or foreign sources, and to recommend such faces as are in their judgment of value to the art of typography and the science of advertising.” This was the result of much discussion by ATA members “of the problem of assimilating the multiplicity of new types being offered for advertising purposes”, a problem with both aesthetic and economic aspects that, as the Board worked to fulﬁll its mandate, became entangled. Although the Board was created a month and half before the Stock Market Crash, type houses—printers who specialized in setting type for use by advertising agencies—were already feeling financial pressure. In the days of metal type the purchase of a typeface (which often meant buying a design in a range of sizes) represented a substantial investment of cash that could only be recouped by continued use over a number of years or even decades. For book printers the decision was difficult but easy to calculate; however, for jobbing printers and, even more so, for type houses it was a huge gamble. Type houses bought typefaces based on the demands of their customers which were in turn determined by the ever-changing fashions of advertising. Typefaces that were only fleetingly popular represented “frozen capital”, a situation that the ATA estimated applied to 40% to 60% of those used in modern advertising composing rooms. But type houses that did not buy trendy new faces risked losing business. 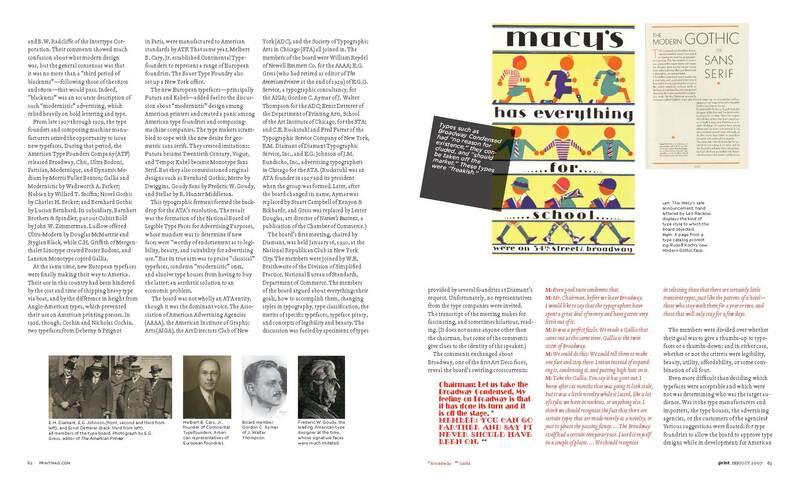 In 1929 advertising agencies were clamoring for typefaces associated with modern design—a term which mainly meant Art Deco, but that also included the Bauhaus, die neue typographie and the German schutzmark movement. Because the United States had declined to participate in the 1925 Paris Exposition des Arts Decoratifs et Industriels—the source of the name Art Deco—its effects were not felt in this country until two years later. But as soon as department stores began to promote art moderne (as it was called by contemporaries) fashions and furniture, the advertising agencies jumped on the style. In the September 1927 issue of The American Printer J.M. Bowles approvingly wrote about the “modernistic” style as introducing some freshness into American printing and advertising, but E.G. Gress, the magazine’s editor, warned that “At no time in the typographic craft is sanity so necessary as now.” Two months later the magazine presented a symposium on the style with input from printers D.B. Updike and Hal Marchbanks, designer W.A. Dwiggins, and B.W. Radcliffe of the Intertype Corporation. Their comments showed much confusion about what modern design was, but the general consensus was that it was no more than a “third period of blackness”—following those of the 1820s and 1890s—that would quickly pass. “Blackness” was not merely a term of opprobrium but an accurate description of “modernistic” advertising, much of which relied heavily on bold lettering and type. Seeing the new “black” style the type founders and composing machine manufacturers seized the opportunity to issue a string of new typefaces, beginning in late 1927 and continuing through 1929. During that period American Type Founders Company (ATF) released Broadway, Chic, Ultra Bodoni, Parisian, Modernique and Dynamic Medium by Morris Fuller Benton, Gallia and Modernistic by Wadsworth A. Parker, Nubian by Willard T. Sniffin, Novel Gothic by Charles H. Becker, and Bernhard Gothic by Lucian Bernhard; and its subsidiary Barnhart Brothers & Spindler put out Cubist Bold by John W. Zimmerman. Ludlow offered Ultra-Modern by McMurtrie and Stygian Black, while C.H. Griffith of Mergenthaler Linotype created Poster Bodoni and Lanston Monotype copied Gallia. At the same time new European typefaces were finally making their way to America. Their use in this country had been hindered by the high cost and time involved in shipping type by boat, and—most important of all—the difference in height between them and Anglo-American types which prevented their use on American printing presses. But, in 1926 ATF manufactured Cochin and Nicholas Cochin, two typefaces from Deberny & Peignot in France, to American standards; and Melbert B. Cary, Jr. established Continental Typefounders to represent a range of European foundries. Also the Bauer Type Foundry set up a New York office during this period. The European typefaces—principally Futura and Kabel—added fuel to the discussion about “modernistic” design among American printers and created a panic among American type foundries and composing machine companies. The type makers scrambled to cope with the new desire for geometric sans serifs. 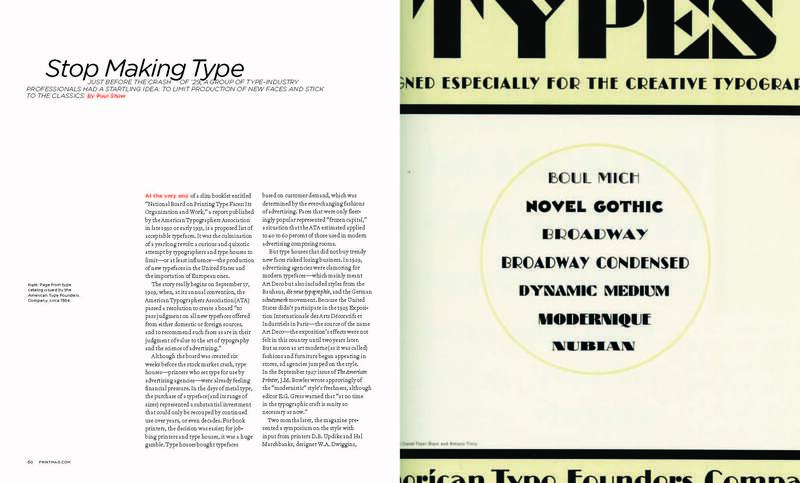 They quickly issued imitations—Futura as Twentieth Century, Vogue and Tempo and Kabel as Monotype Sans Serif. But they also commissioned original designs such as Bernhard Gothic, Metro by Dwiggins, Goudy Sans by Frederic W. Goudy and Stellar by R. Hunter Middleton. It was against the backdrop of this typographic ferment that the ATA passed its resolution. The result was the formation of the National Board of Legible Type Faces for Advertising Purposes whose stated mandate was to determine if new typefaces were “worthy of endorsement as to legibility, beauty, and suitability for advertising use”. But its true aim was to praise “classical” typefaces and condemn “modernistic” ones, thereby absolving type houses from the responsibility of having to purchase the latter. The solution to the economic problem was an aesthetic one. The Board was not wholly an ATA entity, though it was the dominant voice. The Association of American Advertising Agencies (AAAA), the American Institute of Graphic Arts (AIGA), the Art Directors Club of New York (ADC), and the Society of Typographic Arts in Chicago (STA) all joined in, indicating that there was widespread agreement that a problem existed. The members of the Board were William Reydel of Newell Emmett Co. for the AAA; E.G. Gress of E.G.G. Service, a typographic consultancy, for the AIGA (he had retired as editor of The American Printer at the end of 1929); Gordon C. Aymar of J. Walter Thompson for the ADC; Ernst Detterer of the Department of Printing Arts, School of the Art Institute of Chicago for the STA; and C.E. Ruckstuhl and Fred Farrar of Typographic Service Company of New York, E.M. Diamant of Diamant Typographic Service, Inc. and E.G. Johnson of J.M. Bundscho, Inc., advertising typographers in Chicago for the ATA. (Ruckstuhl was one of the founders of the ATA in 1927 and its current president.) Later, after the Board changed its name, Aymar was replaced by Stuart Campbell of Kenyon & Eckhardt and Gress was replaced by Lester Douglas, art director of Nation’s Business, a publication of the Chamber of Commerce of the United States. CHAIRMAN: Suppose we lay the Bernhard fashion type aside and put up some others which we have. Let us take the Broadway Condensed. My feeling on Broadway is that it has done its turn and it is off the stage. MEMBER: You can go farther and say it never should have been on. MEMBER: Even good taste condemns that. MEMBER: Mr. Chairman, before we leave Broadway, I would like to say that the typographers have spent a great deal of money and have gotten very little out of it. MEMBER: It was a perfect ﬁzzle. We made a Gallia that came out at the same time. Gallia is the twin sister of Broadway. MEMBER: I think that is quite encouraging. I was afraid it was going to be a success. MEMBER: It is really amazing that the American Type Founders should have made the Broadway Condenser [sic]. MEMBER: We could do this: We could tell them to make one face and stop there. I mean instead of expanding it, condensing it, and putting high hats on it. MEMBER: Take the Gallia. You say it has gone out. I knew after six months that was going to look stale, but it was a little novelty while it lasted, like a lot of styles we have in neckties, or anything else. I think we should recognize the fact that there are certain types that are made merely as a novelty, or just to please the passing fancy. At the beginning they get some extra attention and then they disappear and some other thing comes along and takes its place. I think you need some revolving type to replace the old one in order to keep freshening up. I don’t believe there are many types that can be put in that are going to be used for many years. Some of the faces are always going to be good, but they may go out of fashion for a while. It is one of those faces where a customer ought to pay extra if he wants that face used. The Broadway itself had a certain temporary use. I used it myself in a couple of places. I notice a bank over here in modern architecture have used it for their signs. It is harmonious. We should recognize in selecting these that there are certainly little transient types, just like the patrons of a hotel—those who stay with them for a year or two, and those that will only stay for a few days. Even more difﬁcult than deciding which typefaces were OK and which were not (regardless of the criteria), was figuring out how to implement their recommendations and who was the target audience. Was the audience the type manufacturers and importers, the type houses, the advertising agencies, or the customers of the agencies? Among the suggestions that were floated were these: for type foundries to allow the Board to approve type designs while in development, for American type foundries “get these foreign designers to let them cast their type here, and pay them a royalty”, for type importers to be told in advance which typefaces should be brought in (for instance Weiss Antiqua was turned down, even though it was legible and beautiful because it was supposedly too similar to the types of Goudy), for advertising agencies and other type house customers to pay special rates to order unapproved typefaces, for type houses not to stock unapproved designs, for type houses to share inventory (one member even suggested a composing room specializing in “queer faces”), and to simply blacklist typefaces that “are really so bad… in design and legiblity”. The Board failed to adopt any of these ideas. What it did do was accept the idea—apparently suggested by Detterer—of placing typefaces in one of three groups: class 1, types that “conform with the best tradition of the arts”, meaning classic faces such as Caslon and Garamond; class 2, types with “novelty appeal”, those that Gress had labeled as transient types having current popular appeal but whose long term utility was unknown such as Futura and Kabel; and class 3, types with “no reason for existence” and which “should be taken off the market” such as Broadway Condensed. The ﬁrst group were to be recommended typefaces, the second typefaces which a customer should pay for if “wanted badly enough”, and the third typefaces that are disapproved of. (Composing rooms normally charged customers for the cost of setting type not for the cost of purchasing type.) Diamant later labeled the three groups as the “classic”, the “modernistic” and the “freakish”. One reason that there were so many faces for the type houses to buy was the proliferation of me-too designs, some of which were straight steals. The Board tried to address the situation by suggesting that only one design be admitted to each class. The discussion [edited here] focused on Bernhard Gothic and how it differed, if at all, from Futura and Kabel—and which of the latter two was the original and which the copy. MEMBER: This Bernhard is purposely made with little fussy parts to it. It is not in the proportions of the old line Gothic. It is a type letter. It hasn’t got the quality or proportion that those other two letters [Futura and Kabel] have, and this letter would probably be good for a few years and be pleasing to look at. However, we are going to tire of it. The other two I really think are going to leave because they are built well. MEMBER: You mean to say there are customers who ask for Futura and Kabel, and they know the difference? MEMBER: We have customers who want certain type W’s. For instance, he doesn’t want an F with a high A center; he wants the low F’s, although Christ himself and all his angels, with Gabriel blowing the trumpet, and every other thing you could think of, couldn’t tell the difference when that type was set up whether it was a high F or a low. MEMBER: On the same ad they will demand both letters, Futura and Kabel, that is Kabel for the headline and Futura for the body. MEMBER: Would it be impractical for two typographic houses to agree on one putting in Futura and the other Kabel, and then exchanging? MEMBER: Speed makes that almost impossible. You see, it is nothing to have people wait in our place while advertisements are set up, even in the middle of the night. MEMBER: Take Kabel, I think it is a very nice type. One of my clients sees it, likes it, and we start using it. All of a sudden this Bernhard type face comes out and there is a difference there. This curves up and this goes straight. My client sees it and says, “Let’s use that instead of this.” As a result of that our typographer has to start stocking that or our client will go somewhere else. So in order to please a client we start stocking it. We should take that into consideration where this face is different enough from this particular one, to say that that should go in the market in proof form. As long as these are in proof form you are going to have a demand for each one. You are going to have clients who are going to demand it. MEMBER: This is enough different from Futura and Kabel to be used also. MEMBER: There isn’t a great dissimilarity between this Bernhard Gothic Light and this Kabel. It is more or less of the same general character. MEMBER: What will happen then is the typographer I am working with will have both. That is a thing that is expensive. MEMBER: I don’t think this [Bernhard Gothic] is as good a type as Futura. It isn’t quite as good. MEMBER: I think there is something in the cutting. It has a hard machine ﬁnish. It doesn’t have the same effect as Futura. MEMBER: Take the lower case “R’s.” they are a little fussy. They have made a number of letters a little fussy in order to make it a little different. MEMBER: It is a new face. It is not used yet. MEMBER: Some of it is used. MEMBER: I am quite satisﬁed that the other two faces were the originals, the Erbar and the Futura. The American Type Founders have just recently made this [Bernhard Gothic] in competition with the foreign type founders. CHAIRMAN: It seems to me we are afraid to hurt Lucian Bernhard’s feelings by putting this in Class 2. It ought to have its proper classiﬁcation in two. MEMBER: We ought to take special sheets of Kabel and Futura, and we ought to examine them and see which is [the] best of those two. MEMBER: Suppose we decide this is the best, then what? MEMBER: Then I think we must consider the matter of whether they have swiped it from the others. Exchanges like this bogged down the January 16th meeting and brought it to an end without any final recommendations having been made. The Board met again on March 3rd in Washington, DC at the Department of Commerce at the invitation of Mr. Braithwaite. Also invited to the meeting were representatives of the type foundries and composing machine manufacturers. There is no transcript of the meeting and the only published reports of it contain no details of what occurred—or even if the type companies showed up. But the momentum of the Board must have been rapidly losing steam. In March Gress, who still supported the Board’s economic goals, wrote in his column for The American Printer that the real blame for the type house quandry lay with the advertising agencies and not with the type manufacturers; and in April he said that he “would not stop any of our type designers from rendering new type faces that are of more or less permanent usefulness”. He was willing to accpt types of temporary utility. In June he resigned from the Board with no explanation. Other than Gress’ comments the Board’s activities failed to generate any interest among printers. The Board must have realized how futile their mission was. There was no incentive for the type foundries and composing machine manufacturers to voluntarily curtail the production of new typefaces; and there was no desire on the part of advertising agencies to see a reduction in the number of typefaces available to them. The only hope was to convince the members of the ATA to choose well in purchasing new types. Thus, the Board concluded its business by the end of 1930 with the publication of the small booklet mentioned earlier. The idea of ranking types in three classes had been quietly dropped, leaving only those that were approved—though not all of them qualified as “classics”. Of the 27 faces, fourteen of them had previously been approved by the ATA in 1927. Nine of the remaining thirteen were among those discussed at the January 16th meeting of the Board, including Futura, Kabel and Bernhard Gothic, but not Broadway or Gallia. The remaining four faces were safe choices: Nicholas Cochin, Poliphilus and two designs by Goudy. The National Board of Printing Types had no lasting impact on typeface production and usage.Type houses no longer exist in the world of personal computers, layout programs and digital fonts. Type is cheap, type is plentiful. There is no reason anymore to restrict the flow of new typefaces. Long live Broadway!